One of the most written-about women of the Old West will be the topic of a Sept. 11 program at the Cultural Heritage Center in Pierre. 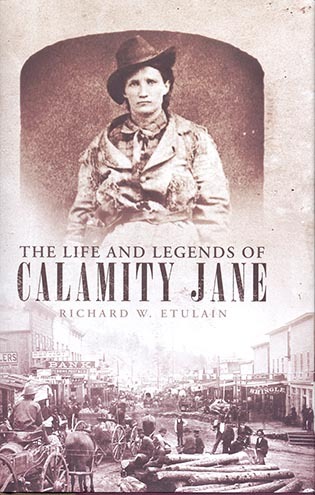 Author Richard W. Etulain will tell about “The Life and Legends of Calamity Jane” when the History and Heritage Book Club meets at 7 p.m. CDT on Tuesday, Sept. 11. “The story of Calamity Jane and the myths that surround her continue to fascinate people. Etulain is an award-winning author who has researched Calamity Jane from her birth through the development of her persona as a wild woman of the West,” said Catherine Forsch, president of the South Dakota Historical Society Foundation, the fundraising partner of the South Dakota State Historical Society and the sponsor of the History and Heritage Book Club. Everyone is welcome to attend the free program. Etulain is the author of more than 50 books on the history of the American West and about the life of Abraham Lincoln. In 1966, after completing a doctorate, he began teaching at the college level. He spent nearly 40 years as a classroom instructor in history, English and American Studies departments at Northwest Nazarene University, Idaho State University and the University of New Mexico. He has also edited many books and made hundreds of presentations about the American West. Etulain began researching Calamity Jane after he decided to write a biography that would appeal to readers about a legendary figure from the Wild West. He realized that there was no thorough life-story of Calamity Jane. He studied Calamity’s life off and on for 20 years and decided that the best approach in writing the book was to devote the first part to Calamity’s factual life story and the second part to stories that have shaped Calamity’s reputation. Readers can, for instance, learn in the first part of the book about Calamity’s being in Pierre in the winter of 1901-1902. In the book’s second part, they can read about how actress Robin Weigert portrayed Calamity Jane in the HBO series Deadwood. “The Life and Legends of Calamity Jane” is available in the Heritage Stores at the Cultural Heritage Center and the Capitol. People in locations other than Pierre and Fort Pierre may call 605-773-6006 for information about how they participate in the program.